Our mini Architectural Birdhouse is handcrafted of hardwood, ply-board and western red cedar or pine shingles for the roof. The finish is a non-toxic, oil-based paint. 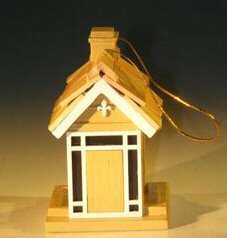 Our birdhouse is intended as an interior decorative piece as well as a Christmas tree ornament. Measures 2.5" x 2.5" x 4.0" tall.